The latest strangeness: three times in the last two weeks questions have arisen about the vendors who worked football games in the stadium. Apparently this was a job sometimes (often?) held by boys and young men who in later years recall it fondly. I have no explanation for this. In any event, our collection of historical materials from the Athletic Department is extensive but I haven’t been able to find anything. I still don’t understand what the “Rice Institute Athletic Association” was but what the heck. If you do, please let me know. I have a cool, football-shaped patch for being a Boy Scout usher at LSU games. Rice may have had volunteer programs like that. Seems like I remember Boy Scouts helping at Rice. What I don’t remember is if they were Rice games or high school play offs. 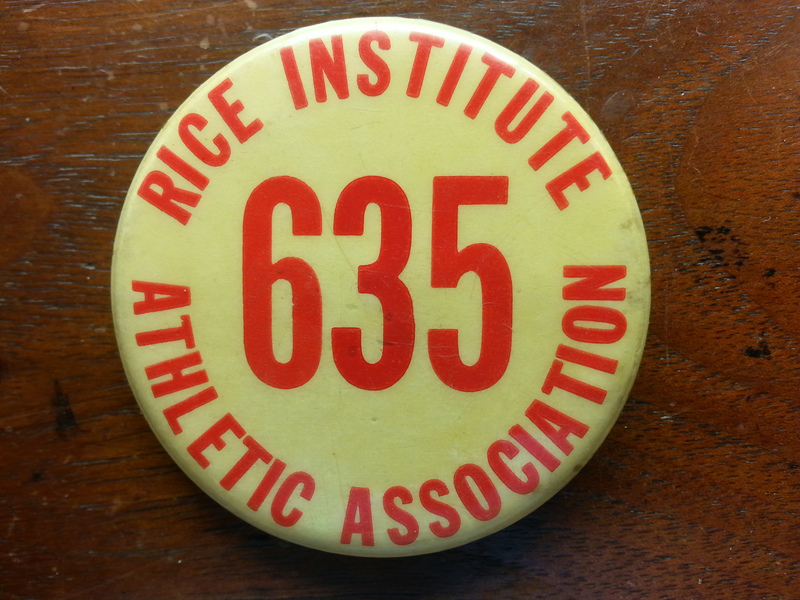 Whatever we’d call it today, the “Rice Institute Athletic Association” has a long history. 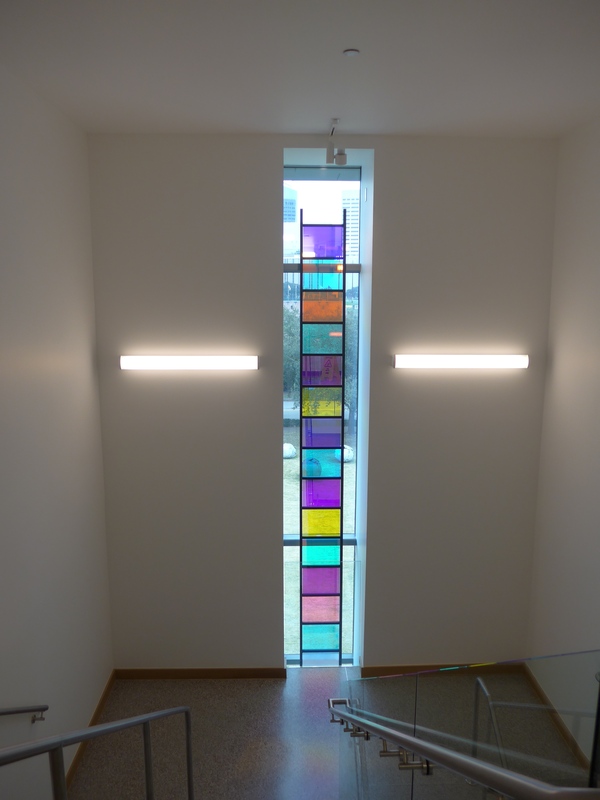 It’s mentioned in the Book of the Opening of the Rice Institute (Vol 1, page 168, note 1) as being formed even before “the first society of students to be organized at the Rice Institute”, the YMCA. The March 31, 1922, Thresher reported that “the first annual interscholastic meet (was) held under the auspices of the Rice Institute Athletic Association.” This meet was specifially for high school athletes, and was apparently considered good local publicity for the new school in town. I’m thinking that the RIAA might have been an organization similar to today’s Athletic Department, escept that in those early days of the Institute, it might have had more emphasis on sports for all students, rather than concentrating largely on intercollegiate contests. I was a Boy Scout usher at a couple of Rice games. We got a special blue and grey Owls neckerchief to wear, and we may have gotten a patch. After everyone was led to their seats, we got to sit in the north end zone and watch the game. I may still have the neckerchief in one of the many boxes of stuff around here. I’m 635’s older brother. Shortly after Rice stadium opened in 1950, I would go down on early SAT AM before a game (Rice or UH) and vie for one of the badges to sell “cokes”. If you didn’t get that, you were relegated to selling peanuts or popcorn. Selling cokes were the good jobs. I did this when I was about 10-12 years old. The badge would get you in the gate before the game. You’d get a galvanized bucket with ice and 12 cokes for $1. You’d go up and down the stairs in the sections shouting “ice cold cokes”. They were HEAVY. You’d sell them for 10cents each.. Wow. 20% return on investment! You had to open the bottle and pour it in a cup. There was a 2 cent deposit on the bottles and you had to turn in the empties. Just before half-time you would try to get two buckets and station yourself just outside the entry/exit to a section. You’d sell out in no time. .If you were lucky, you might make $2-$3 for the day. My brother (#635), 5 years younger did the same thing and I’m pretty sure our two younger (10 and 12 years) brothers did also. It’s probably against the law to do things like this today. My two older brothers and I sold soft drinks at all home games. We bought 10 Cokes and 2 Seven-Ups in a bucket for $1.00 and sold them for $1.20. We were issued change aprons to wear but brought our own bottle cap openers tied on to our belts with twine. While not restricted to only one part of the stadium, we preferred the Lower West stands, especially for afternoon games. The sun did not get in our eyes and there were more reserved seats, possibly for bigger tips. Just before halftime, we purchased two buckets of drinks and set up just outside the aisle entrance, to catch the traffic running for drinks during the break. For kids of 10, 13 and 14, we enjoyed the experience and made a little bit of money as well. As I recall, a good game would net us $3.00 to $4.00. An added benefit was being able to take a break and watch part of the game. I didn’t know many of the players, but do recall seeing John David Crow of A&M.